The first Central Baltic Programme 2014-2020 project has just ended. On the 8th of November 2016 the project Let us be active! organised their final seminar. Project manager Karolina Mackiewicz reflects on the project. The project full title: “Let us be active! Social inclusion of older people through volunteering in Estonia, Latvia and Finland” reveals already a lot. Throughout the project we have aimed at promoting senior volunteering activities to make the elderly feel more connected to the community. At the same time we wanted to promote the idea that seniors can and want to engage in volunteering activities; traditionally we think that younger generation should be the ones volunteering for the elderly as older people are weak and tired, but there are many ways to be active and not always physical strength is required to help others. Riga for example set up a call center for seniors managed by seniors. It was a pleasure. One year and a half is a short time, but if you are committed you can achieve positive change. The activities were established in the project framework, but they will continue after the project lifecycle: sustainability of the results has been ensured and the activities will develop further in the future. I think we managed to change local official’s perceptions and gain new knowledge about the topic: before, nobody asked seniors if they wanted to engage in volunteering activities. We did. We conducted a surveys and from the results we realized that elderly people would be happy about participating in volunteering activities, as long as they don’t have to make long term commitments, and they don’t have to perform their tasks alone. They have retired so they do not want a job, rather an opportunity to put their skills to use and be connected with their community. Do you think you were able to reach your target groups? Yes, I think we managed quite well and the cities and NGO’s helped a lot with it. We prepared a survey which was conducted for example in supermarkets or door to door: we wanted to reach also people who are not socially engaged. But what we learned was that the word of mouth was the best channel to pass information. This is why, in Turku, the city is planning to establish a senior volunteering ambassador network. I hope so! From the stories we heard from our coordinators it seems that at least it made it brighter because it gave people the opportunity to do something good together in their free-time. So I think, yes, the project managed to bring a positive change into people’s life. You mentioned you have heard stories related to the project from the city coordinators. Can you tell us some? 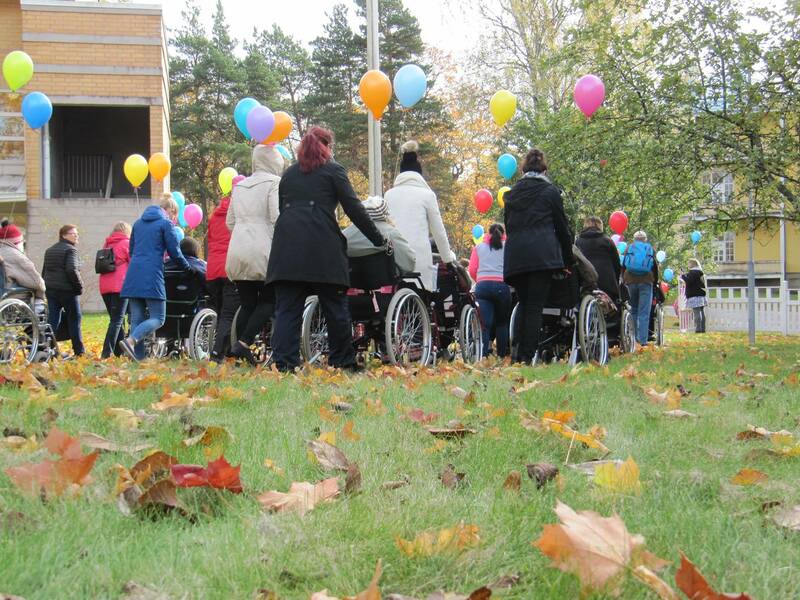 One of the activity organized in Turku entailed senior volunteers to visit once a week elderly people who are unable to live by themselves and the whole group has a walk in the Kupittaa park. One day in October Matti, a 60+ volunteer, decided to join the group for their weekly walk and picked up Irja, an elderly lady who sits on a wheeled chair. 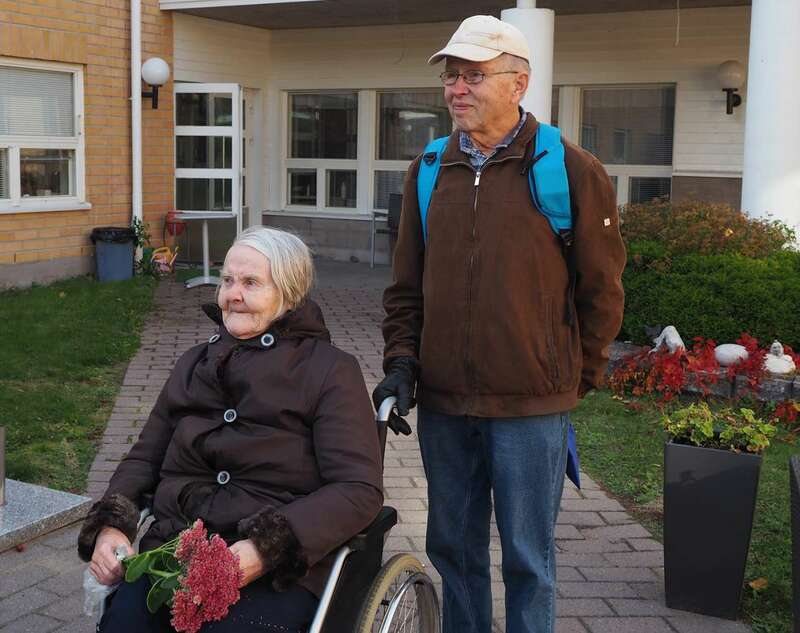 Matti owns a small garden in Kupittaa and decided to pick up flowers for Irja. She was really touched, it was a beautiful moment. 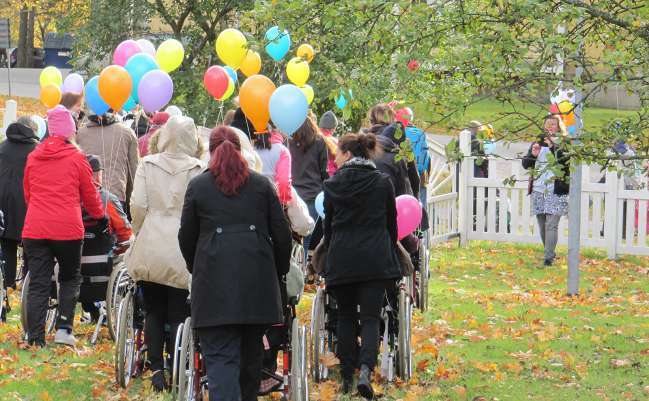 They were both very happy and the whole group expressed positive sentiments towards the whole experience. Another story that comes to mind is about Elena, a volunteer in the Riga’s senior call center, who said that having the opportunity to give information to other elders about e.g. free cultural events in the city or to brighten their day if they feel down, makes her really happy. Here a little challenge, could you tell us the story of the project in six words? Older people are a precious resource. What I mean with it is that we should not forget about that! We shall not consider older people a problem, rather find ways to benefit from their experience and expertise. Do you think cross-border cooperation was instrumental to achieve the project results? If yes, in which way? Yes, it motivated cities to embark on this project journey. A city alone maybe would not have been on board. The project offered cities the opportunity to learn from each other and to count on the support of colleagues facing the same challenges. At the same time they felt part of something bigger. It also offered the opportunity to test the idea in many countries. If only Finland was involved, the neighboring countries, when reading about the project results, would have probably claimed that: “yeah well, that was Finland, in our country something like that would not work”. Cross-border cooperation made them realize they are all facing similar issues and that yes, the approach could be different, but universal guidelines were issued and followed and brought good results to each city. And now the success of each city can be transferred to other ones. Do you think elderly people who participated in your project understood the source of funding being the European Union? Yes, it was communicated in every activity we organized and the EU logo was displayed in all of our printed material and during events. Matti and Irja in Turku. Photo: Karolina Mackiewicz. Seniors on a field trip. Photo: Karolina Mackiewicz. Seniors walking with seniors. Photo: Karolina Mackiewicz.